If you have patience, creativity and the love of working with children, you have the potential for an important and rewarding career as an elementary education teacher. The Elementary Education PK-6 initial licensure program and Master's program is designed to provide professionals with the specialized knowledge, skills, and dispositions needed to meet the educational needs of students attending today's elementary schools. Students complete the masters degree in Elementary Education program by taking 39 credit hours of courses that will fulfill the state and the National Council for the Accreditation of Teacher Education (NCATE) Elementary Education degree requirements. Students have the option of attending either the accelerated Professional Development Schools (PDS) Year Long Cohort for four academic terms, the PDS Year Long Cohort (fall start option) for five academic terms, or the PDS Semester Long Cohort for six academic terms. 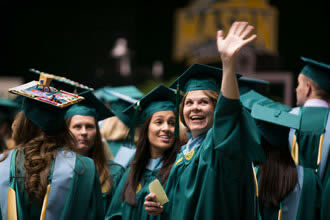 Click here to see a comparison of the Elementary Education masters programs. The Elementary Program also offers a Bachelor's/Accelerated Master's Program. Qualified undergraduates may be admitted to a Bachelor's/Accelerated Master's program and obtain both a BA in Integrative Studies with a Concentration in Elementary Education and an MEd in Curriculum and Instruction with a Concentration in Elementary Education within an accelerated time frame. Students meeting the qualifications listed below may be admitted to this program following completion of 90 undergraduate credits. They may then take 12 graduate credits within their senior year (i.e., six credits will partially satisfy requirements of both the BA in Integrative Studies and the MEd in Curriculum and Instruction; six credits will be completed as reserve graduate credit toward the MEd only). If students earn at least a 3.00 in these classes, they are granted advanced standing in the master's program and, upon completion of the bachelor's degree, must then take an additional 27 credits to earn the master's degree. All students in elementary licensure and master's degree programs will be required to submit and successfully complete a series of performance-based assessments. These assessments will include content knowledge, pedagogical skills, and dispositions.